"I'm an old hippie. It's just a spitting-in-the-wind occupation." It is early morning, and the fog is lifting off the Smoky Mountains. 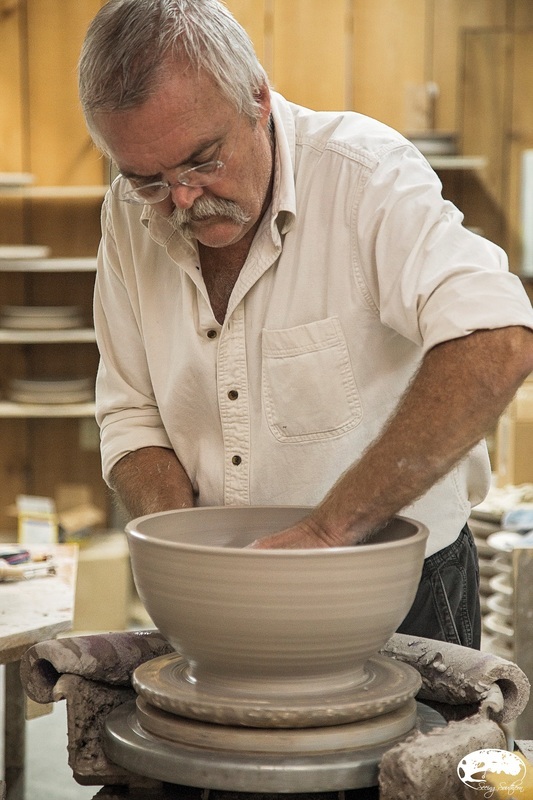 On Glades Road in Gatlinburg, Tennessee, there's a string of artisans from one end of the winding road to the other; my stop this morning will be Alewine Pottery to meet Robert Alewine. From Sevierville, my GPS takes me the scenic (or rather, "where the heck am I") route. Boogertown Road, Powdermill Creek. Shorter in distance than the main route through Gatlinburg, the curvy mountain roads delays my arrival time. Having been told that Alewine is an early riser, I knew he would be waiting. The gallery sits around a curve of Glades Road, in a building which has expanded over the years. 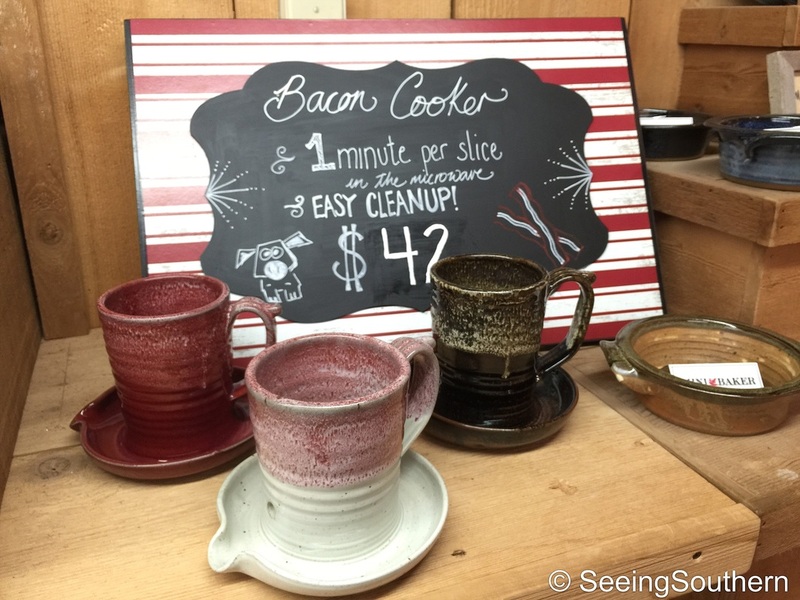 Shelves display his work, his vision of mugs, bowls, even bacon cookers, most with the signature Alewine maple leaf. He walks toward me, hand outstretched sporting an electric smile. I take his hand and it's not the greeting or the introduction I remember; it's the size and softness of his hands. of nondescript rectangular clay which will be a bowl by the time we finish talking. We start our conversation like most Southern folks. "Where are you from?" Surprisingly, we both say North Georgia. Now, the conversation feels like home. 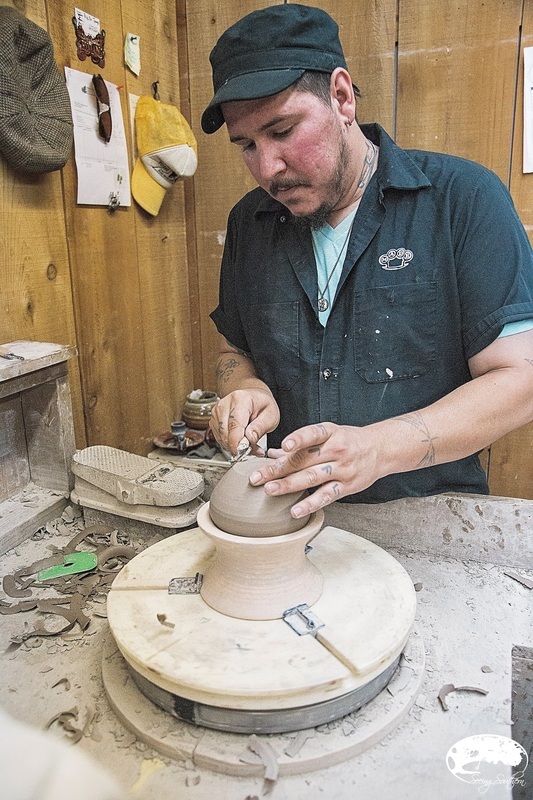 Once Alewine realized as a teenager he had talent and that clay was his medium, he began molding his own life. He created a shop in his dad's garage. Although now it's [making pots] easy, in the beginning it was frustrating. "You're dripping clay off the wheel. You're slamming it off the wall. You're screaming and cussing like a sailor." He remembered his dad coming in after a day at work and looking around. "I'd have balls of clay just peppered on the wall. It was hard so hard to figure out." His self-made beginning began with a quest for knowledge. "I was just starved for information," he says. "Back then there was no access to anything. So, I'd go anywhere to find somebody to help me learn." He eventually tracked down a potter near the top of Lookout Mountain in Jackson, Tennessee, and studied with him a summer. "I had this old pop-up camper and this old feller said, 'Son, you just pull that camper back in the woods just as far as you can get it.' So I backed it up, wedged it just as far as I could in a bunch of trees. Popped that top up and I'd wake up in a cloud every morning. The animals and crickets would put me to sleep at night. At first, it sounded like you were in New York City; it was so loud. Then, after awhile, you couldn't sleep without it. I worked with him a summer, and then I got married, and went on with living life." 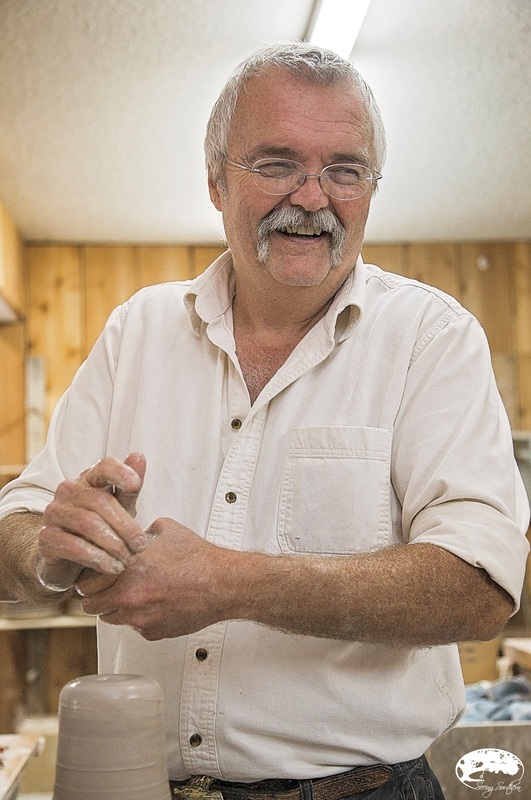 "Connie married a potter," he says with a bit of worry. 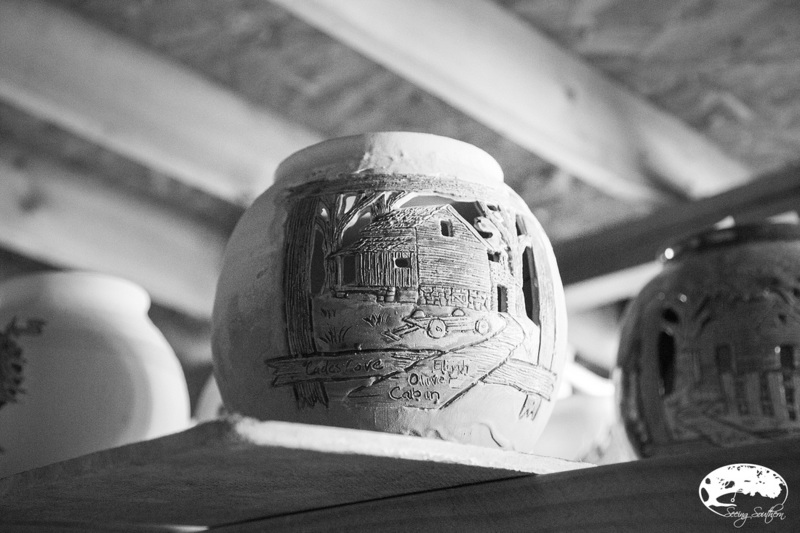 Both 21 in 1975, the marriage between the girl and the potter has lasted 40 years. Alewine continued to apprentice for other artists, even trying to make a go of it, "but it didn't work out. I didn't know what I was doing." Then, in 1983, he moved to Gatlinburg, and I've "been here ever since, slapping clay." His current location on Glades Road opened in 1991 with only a salesroom and a work room. He worked alone, having only a few apprentices in the 1990s. It was a hard life, sometimes working 20 hours a day, 7 days a week. Hoping to grow his small business, he confessed that he did "a lot of TV advertising. They'd call me. 'I'll sell you this.' I'd buy it." Over the years, he realized he was spending lots of money on TV advertising for local access channels. Then, he thought. "As much as I'm spending, why don't you just sell me my own channel." And with that, Channel 20 became Alewine TV and as they say, the rest is history. 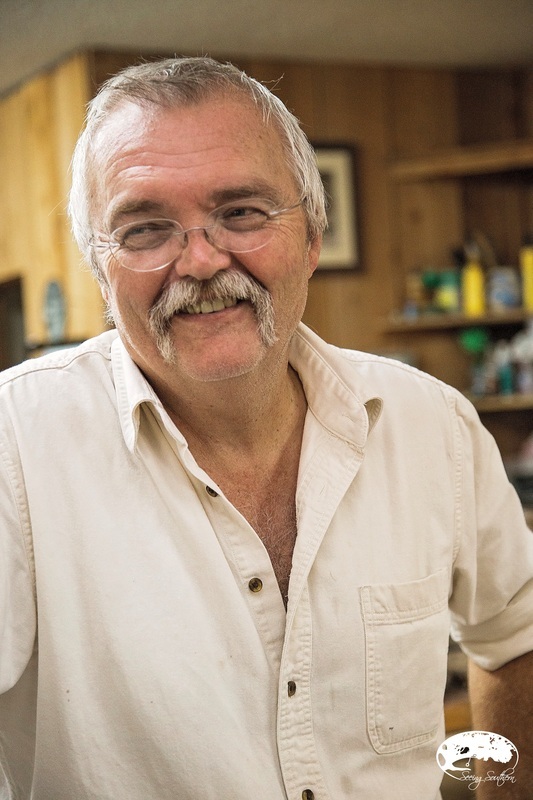 He attributes that local channel - filled with old videos, of the Appalachian lifestyle, cooking on an open fire, canning - for building his business. "People just ate that up," he laughs. In between the videos, he'd slide in commercials about his business. "We'd turn it on in the morning and don't turn it off till we leave. It'd be on all day. It was a good run while I had it." Once Comcast took over with its high-numbered channels and complicated contracts, "I killed it." He professes (as most creatives will agree) that "people that are art minded are not business minded. So I've had to make myself become business minded." He employees 20 and considers them his responsibility because "the checkbook is mine. You start carrying their problems and their worries and before you know it, you've got this big extended family that works for you." He believes that the community "yearns for the family business. People want it to be like the family farm or the hardware store in the little town. Everything has gone corporate; people want the personal." "People yearn for simplicity," he believes. "We're caught up in complexity. It's human nature. People love the past, love to talk about when they were little kids. I watch my kids talk about when they were kids, when phones didn't have grapevines. Everybody's got some kind of memory." His memory of how the maple leaf became his signature takes him and his daughter Lynn to the Yellow Daisy Festival in Stone Mountain, Georgia. "There was this woman and she was making pots. She'd turn a bowl over and take a leaf and she'd cut a leaf out of a piece of clay. She was draping them over a bowl." Realizing that that worked well with their Smoky Mountain location, they figured out how to incorporate a leaf into the pots. 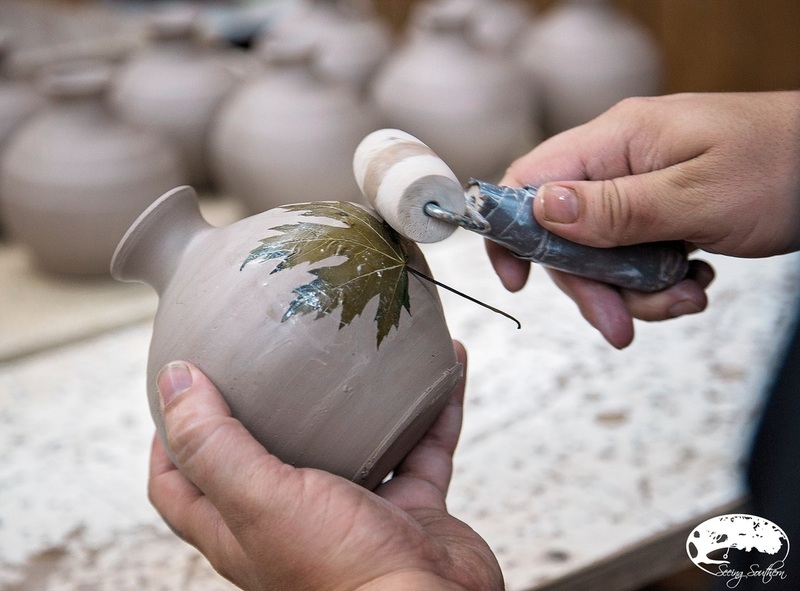 "We'd wax it so the glaze wouldn't stick, and go ahead and glaze the pot like we do now. It caught on really fast." That was in 1997. Today beside the wheel, you'll see a bowl filled with leaves in water, resting, waiting to be the next model for the next masterpiece. "We've been making leaves ever since. Now people won't let us quit. If I make a pot without a leaf, I'll sell 10 with leaves before I sell one without." He admits the leaves are very important, yet knows "I'm not the first one" to use leaves in art. 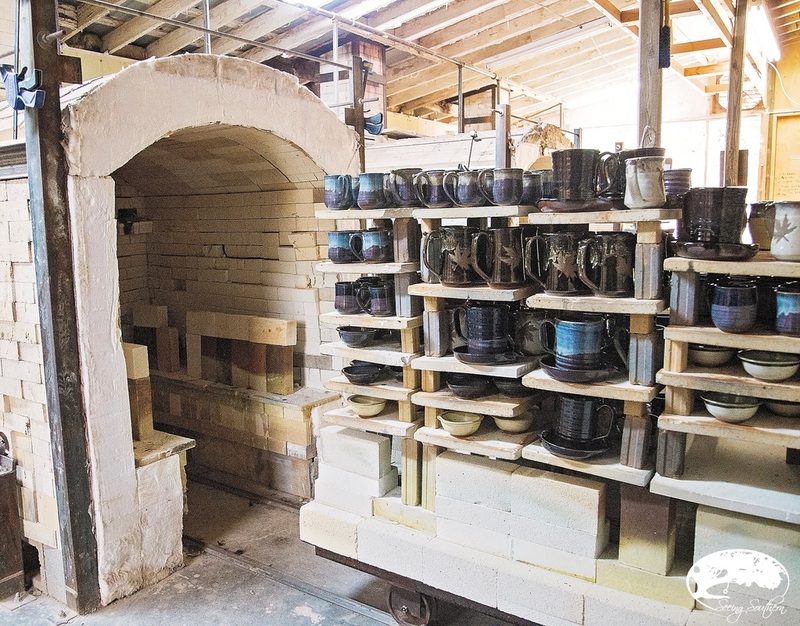 His definition of pottery goes like this: "It's working class art. It's more than just art. Working class people won't justify spending the money unless it has a function. It can't just sit there." As our conversation ends, he confesses, "I'm an old hippie. It's just a spitting-in-the-wind occupation. A very defiant life. People love to identify with a defiant life. 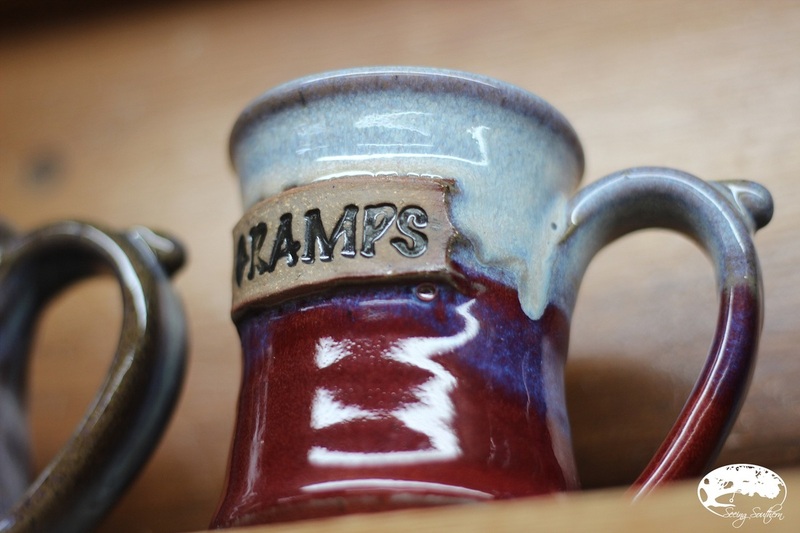 If you meet a potter who's been potting for 40 years, I guarantee there's issues. Old hippies or something." Many have walked his pathway, "guys who were young, wanted to be an artist, a musician, do things that were against the grain and not many of them stayed with it. It's too hard." Most days, you'll find him on Glades Road, and he'll greet visitors with smiles and handshakes. Forget the struggle; unless you're a reporter, my guess is that you'll never hear about how hard it was or how he battled. Ask him about his grandchildren - all six of them. His eyes light up (even more) and tells you "they're in the clay all the time." 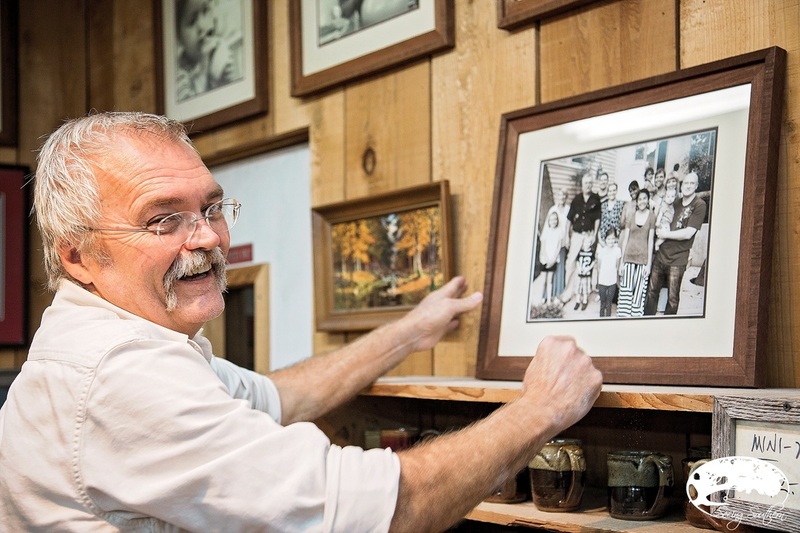 He takes pride in his family business and its 40 year legacy. 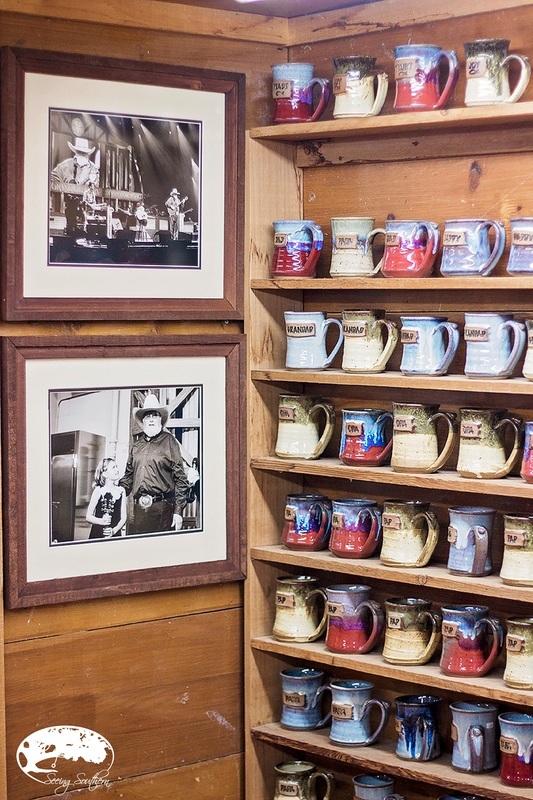 As you walk through the gallery, you'll view their family moments through photography. "To say the kids have my drive" - Lynn, Carmen and Mark - "I don't know." But one thing for certain: they all have dirty hands - in a good way. 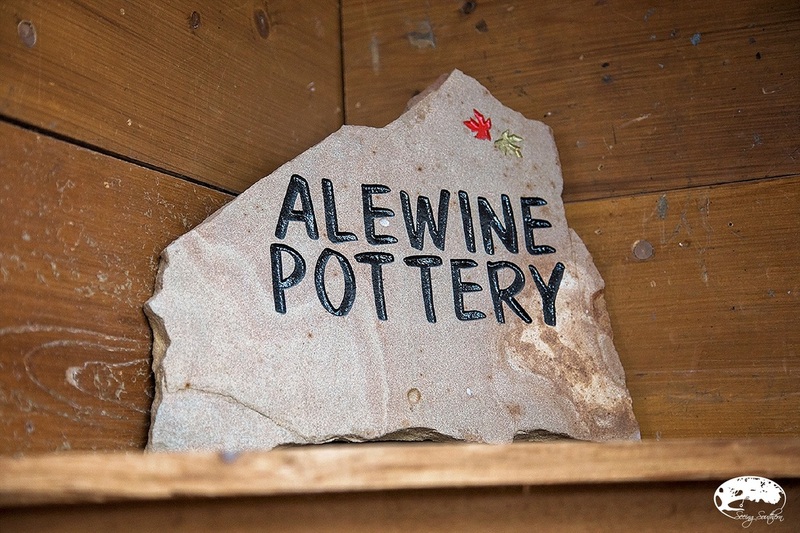 Visit Robert, his family and staff at Alewine Pottery on Glades Road in Gatlinburg, Tennessee. Take home a piece of working class art.
" . . . always was an art guy. In high school, I'd do murals on the wall at school. Horses, a knight on a horse in a gym. [I had] a good art teacher my senior year. He really inspired me, and I knew I had some talent. Then when I started college, I made a pot. The thing about art, to be creative, it just flows from you. Painting was the only medium I was aware of in high school, but I didn't have the discipline to sit and paint. I always like to work. 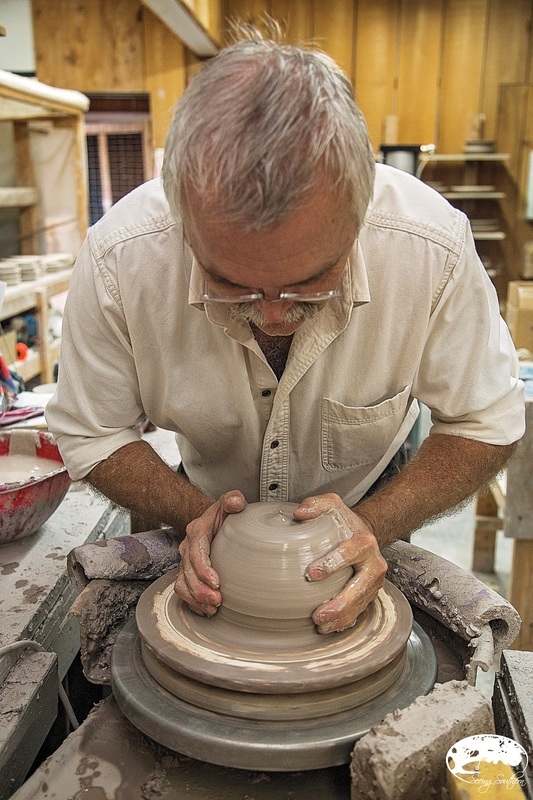 I would make a pot, wedging up the clay, and I can see it . . . spontaneously . . . five minutes later, you got this pot. I just fell in love with the whole creative process of making that pot. Even today, I can come in in the morning and look back and see what I did. It's very rewarding." 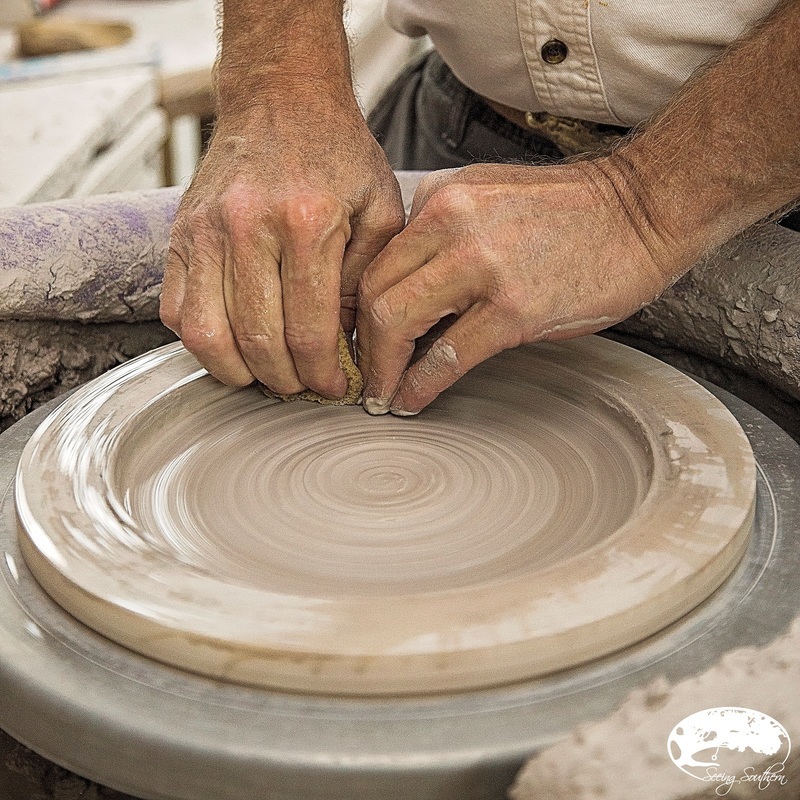 "I don't know if it [working the wheel, making pots] helps with stress or not. Stress. I'm so accustomed to stress that if I had six months without stress, I'd go find some. It's like when a fat person loses weight and he looks in the mirror and goes, 'This ain't right.' That's the way I am. I've lived with stress so long, and it never seems to go away that if I won the lottery, I'd screw it up. Have I handled it well? I'm experienced."